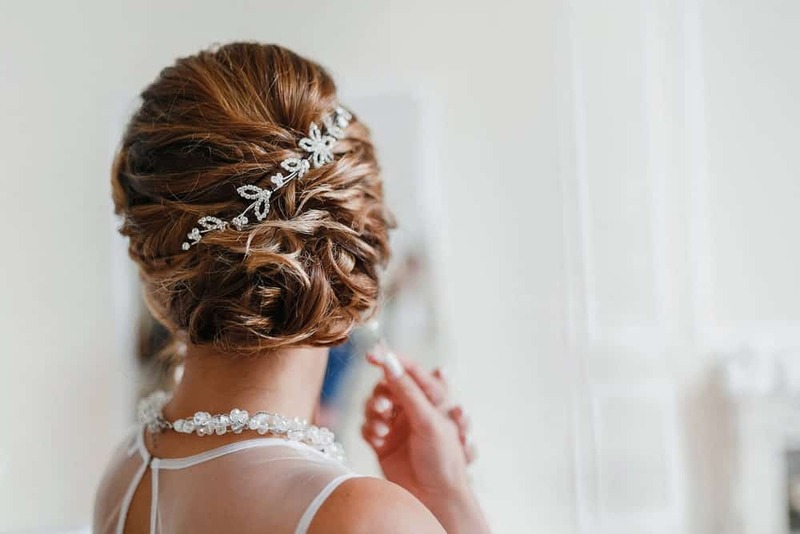 Welcome to our main prom hairstyles page for women where you can scroll through dozens of example hairstyles and haircuts terrific for prom. You’ll find all kinds of examples including different styles, lengths, hair types, hair colors and face types. We update this frequently so that you will get a chance to see the latest and most popular prom styles every year. Enjoy the big event!! This is a beautiful hairstyle for prom. With interwoven, intricate braids it’s beautifully alluring while still being soft and not too sleek so it looks incredibly feminine. 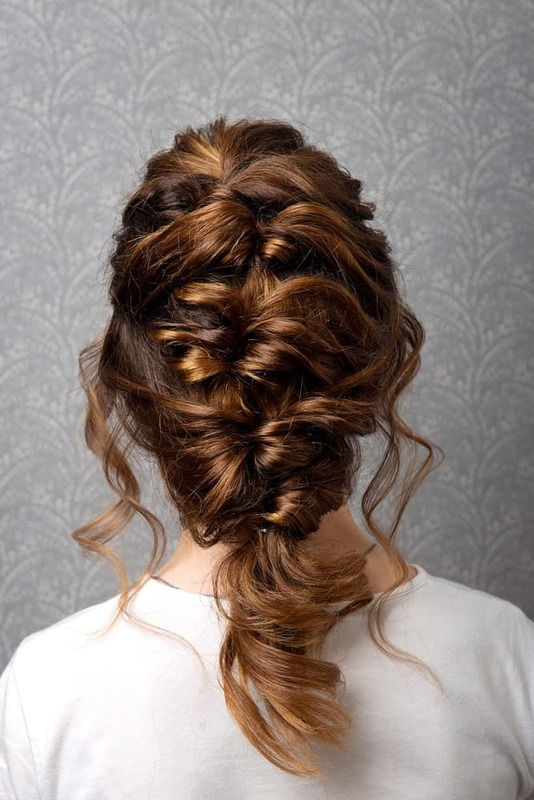 If you want something more polished for prom, why not go for this beautiful braided updo? It’s neat, elegant, and a perfect complement to any dress. 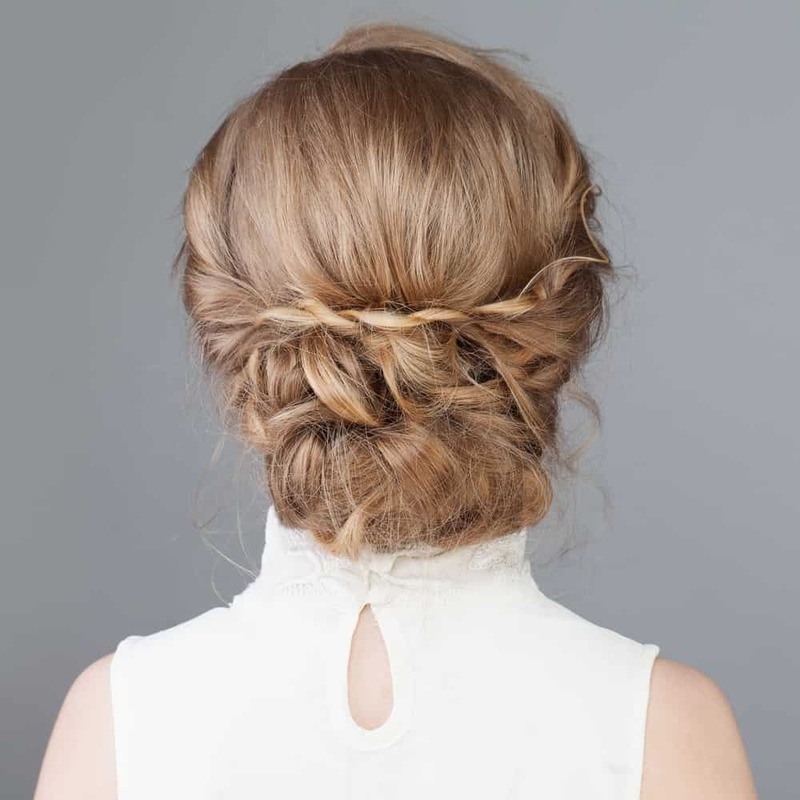 If you want an updo but don’t want braids, try this hairstyle. With messy waves and carefree bangs, it’ll make you look effortlessly stylish while keeping your hair behaving through all that dancing. A little bit of neatness, a little tousled, this hairdo is perfect for a soft and voluminous look. It works great with thicker and longer hairstyles but it can go great with medium length hair too. Bonus plus if your hair is already wavy/curly to begin with – you won’t need to do much to it! 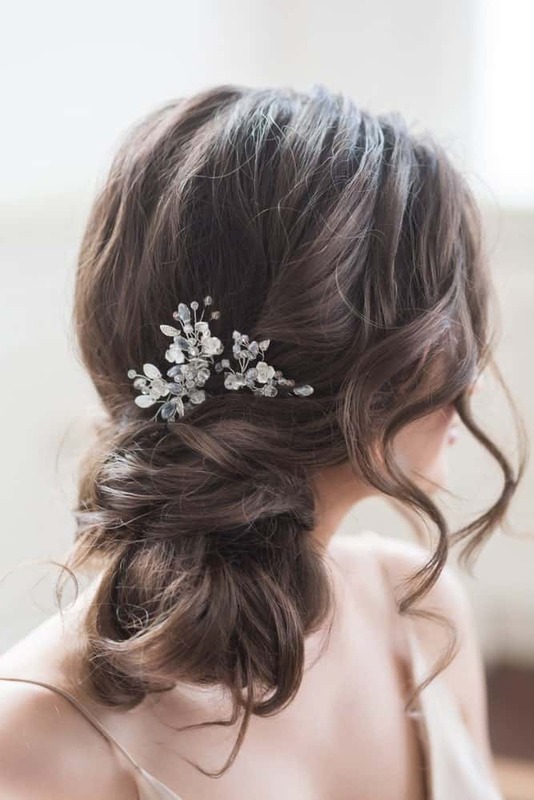 Though this may be a bridal hairdo, we think it will look absolutely stunning at a prom. The curls are more defined and elegantly bundled to the side for a soft finish that looks very old Hollywood. 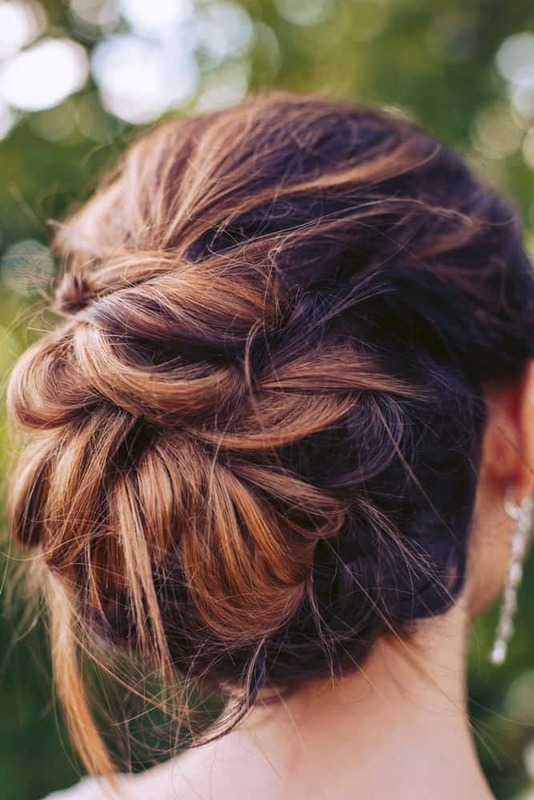 We love this updo for a lot of reasons. The side bun is neat and the flowers add a lovely touch. The fact that it’s loosely tied gives it a youthful beauty. But the touch of the single lock that curls down the neck is absolutely beautiful. A simple hairdo looks so much more modern when it’s done up asymmetrically. This could work great with shorter hair too and look elegant. A ponytail never goes out of style. 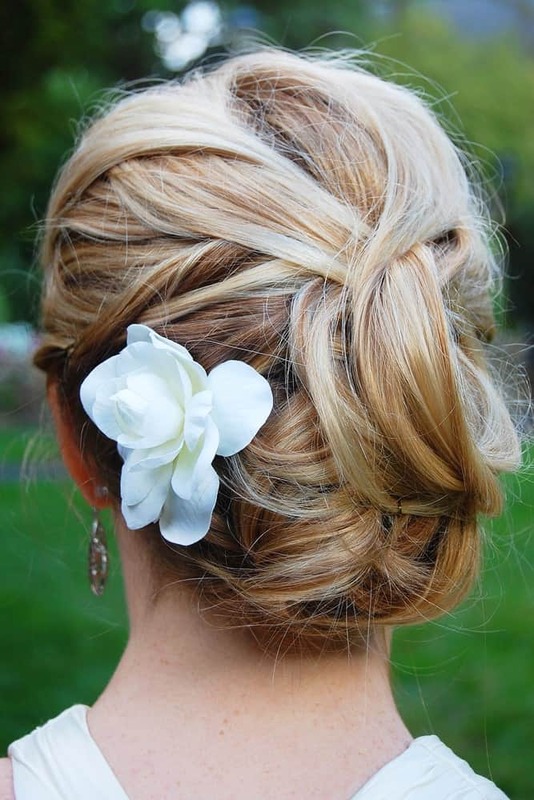 Keep things simple but delicate with this wavy ponytail, finished off with some flowers for a nice, youthful look. 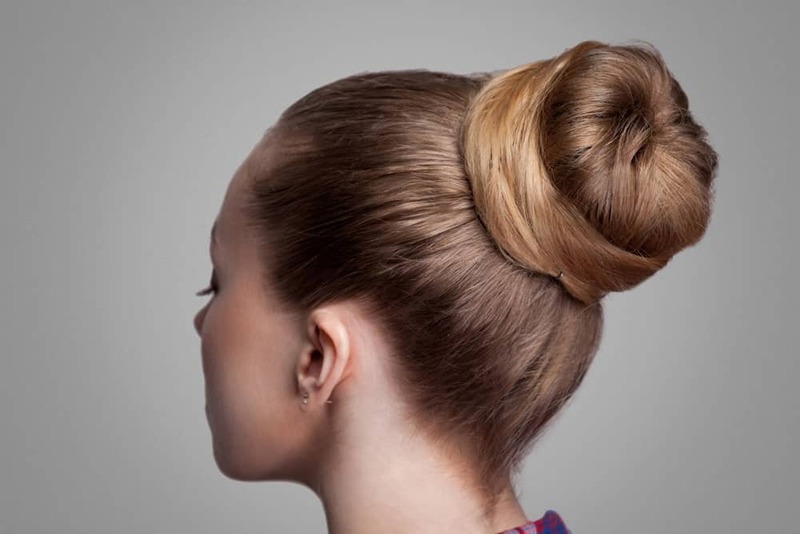 This hair bun looks good with any kind of dress and keeps things easy breezy with a few wayward strands of hair escaping the bun. Very reminiscent of Mehgan Markle! If you want to leave your hair open without doing much, curls and a flower headband are a great idea. This hairdo is more ‘girl next door’ if that’s the vibe you’re going for. 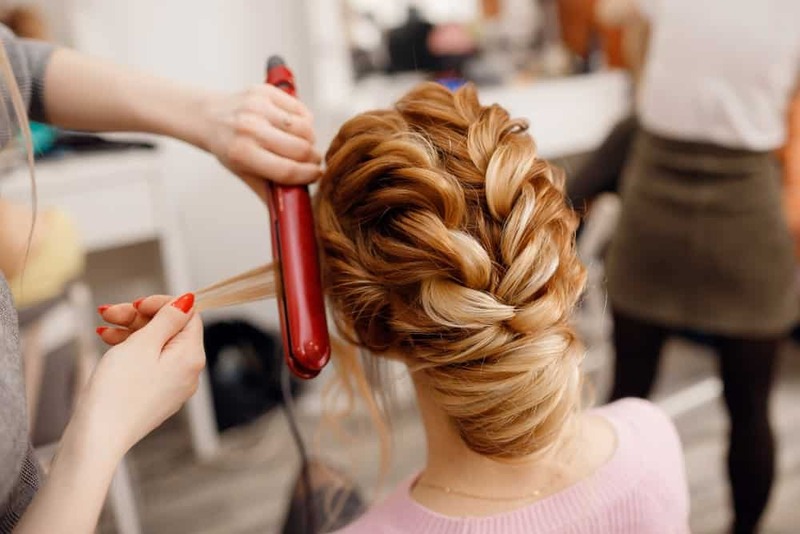 With a waterfall braid that continues down the back of the head, this is a more casual hairdo that you can still dress up with the right makeup and dress. Asymmetrical French braids will give you a modern, edgy look that will have everyone turning their heads! 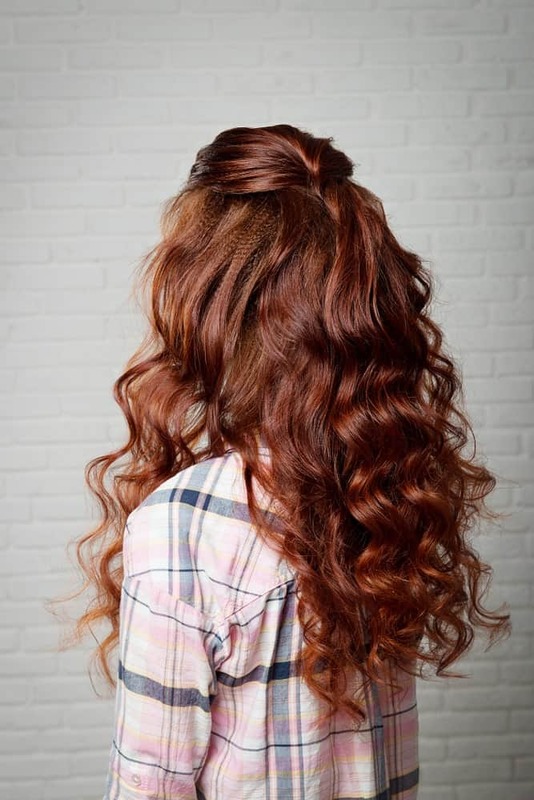 This waterfall braid continues down the back of the head, giving a unique finish among a bed of curls. Definitely something to add a little oomph factor to your hairstyle. 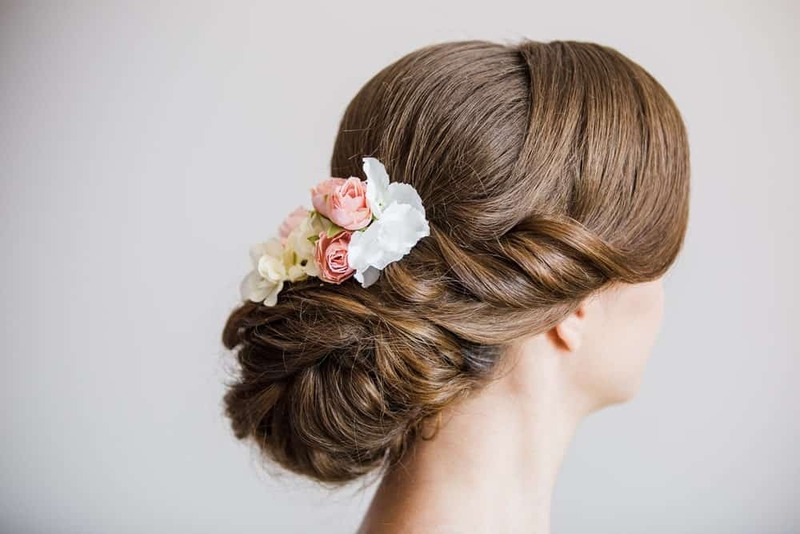 If you want a simple and elegant updo, consider getting a French twist. It’s going to add volume to your hair and you can keep it sleek or curl a few strands around your face for a softer look. 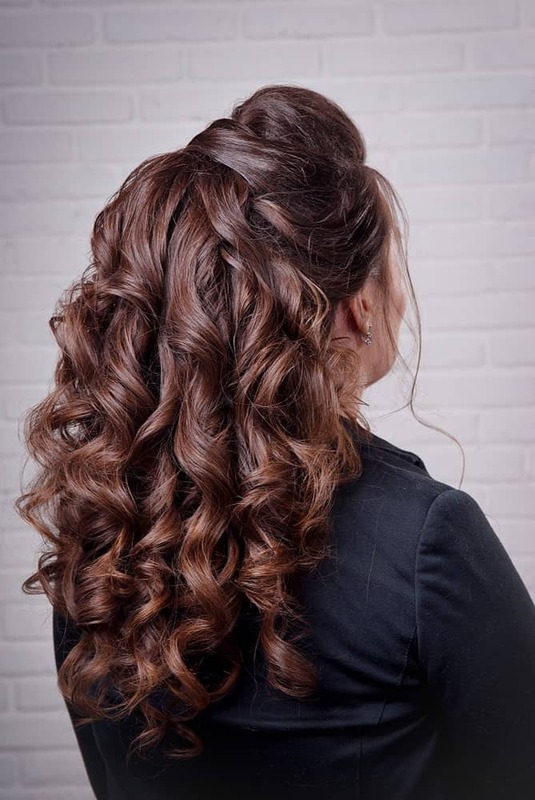 Combining a flowing braid, soft curling locks and a backcombed crown gives a beautiful result! 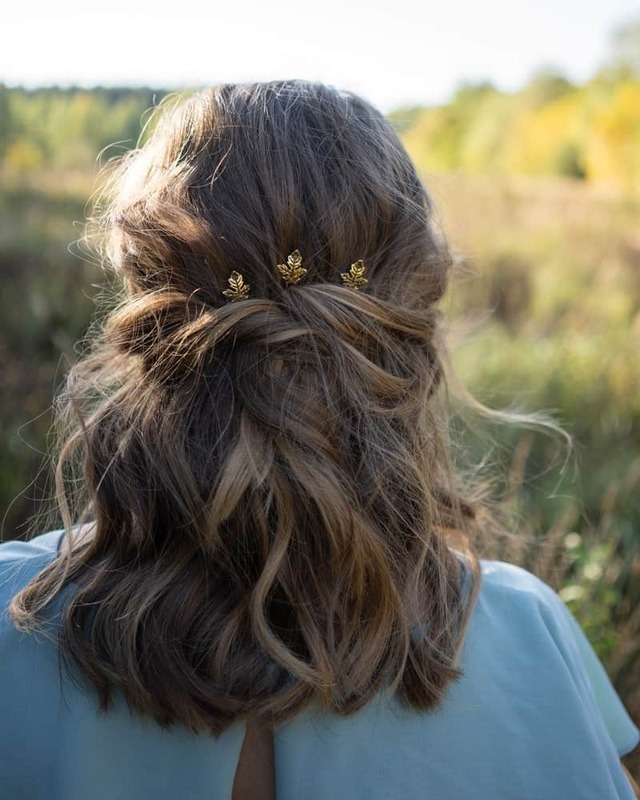 A modern, easy side bun with flowers and curly strands around the face make for a gorgeous hairstyle to go with all types of dresses! 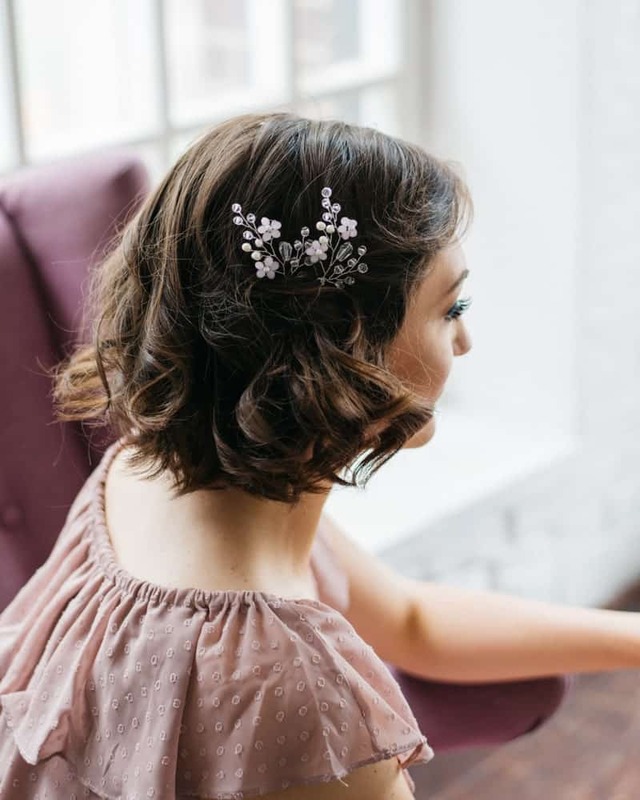 If you have short hair to begin with, you can dress it up with soft curls at the end and a stylish flower accessory. 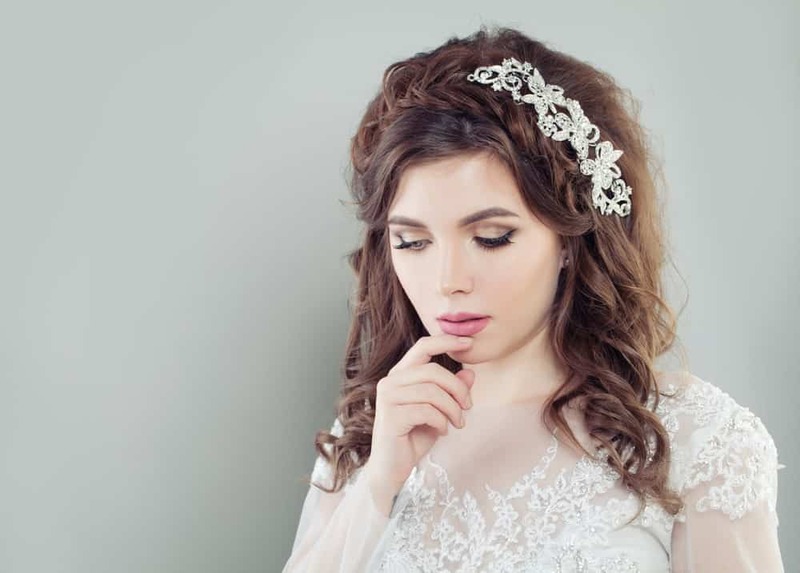 A side bun with soft wavy hair can be made more appealing with the right accessory. Place it asymmetrically for a more elegant finish. 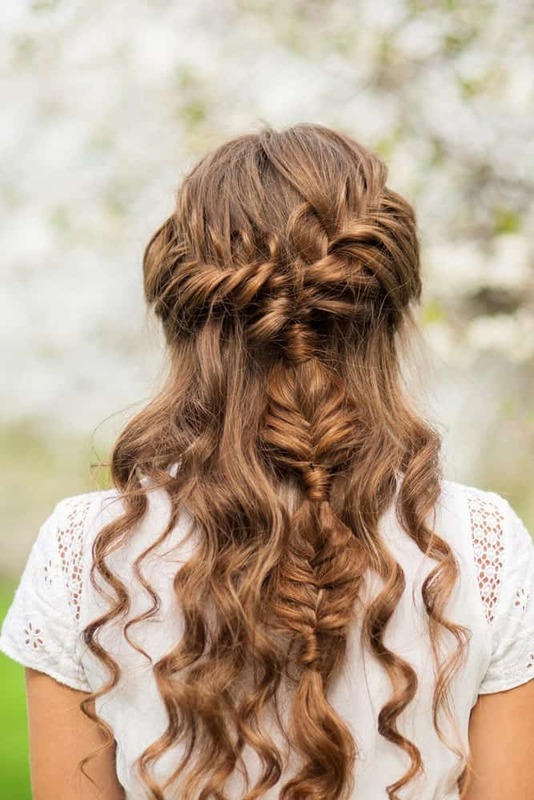 While a Greek braid may look too casual for prom, trust us when we say that you’re going to look absolutely unforgettable. 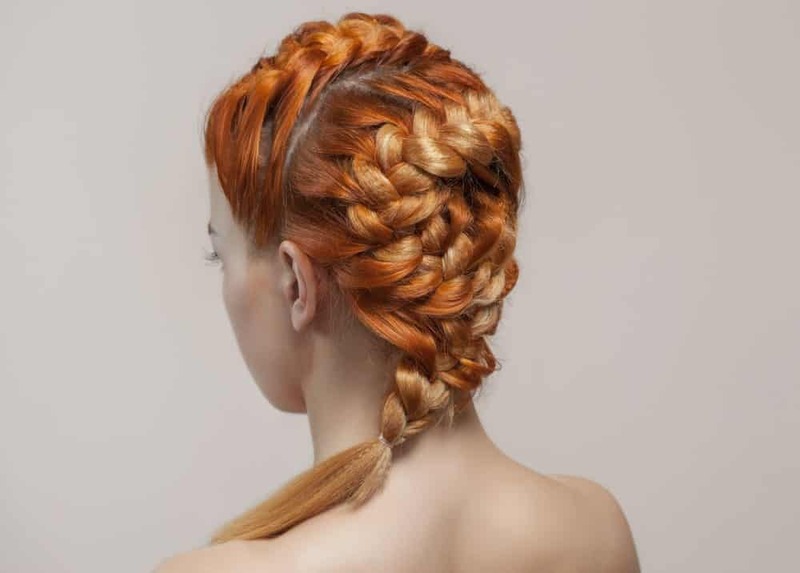 The braid adds volume and character while still being timeless. You know what goes best with a good red lipstick? Classic Hollywood curls. These curls look great swept off to the side and can be a great complement to an Old World glamor style. An easy hairstyle for any length of hair is a simple half twist. You can accessorize it for a fancier finish or leave it as it is for a nice, soft look. 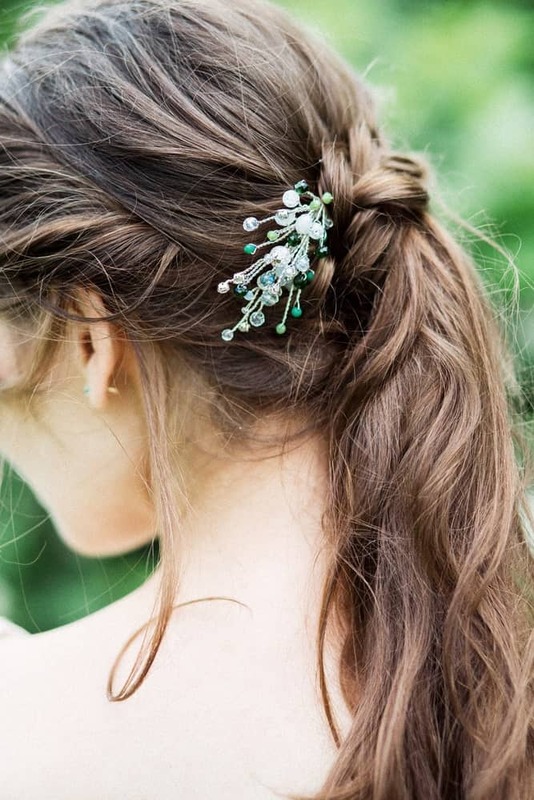 Using small pins in your hair a little apart from each other is a great way to accessorize, if you don’t want to use a single hair ornament. 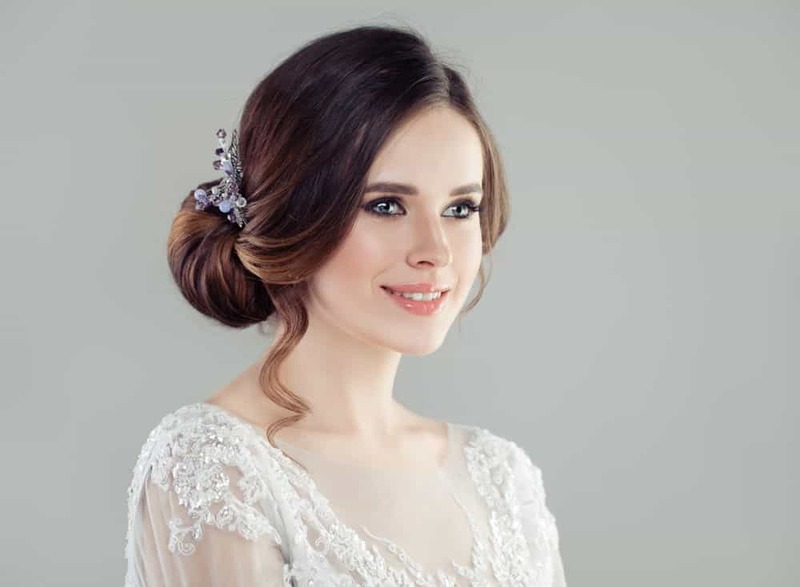 Another timeless look is a sleek, backcombed updo with softer curls towards the bottom. It makes any hairdo look just that much more elegant. This is a perfectly trendy way to wear braids! You can begin with braids on either side of your head but end with a sleek French twist at the bottom for a gorgeous finish. 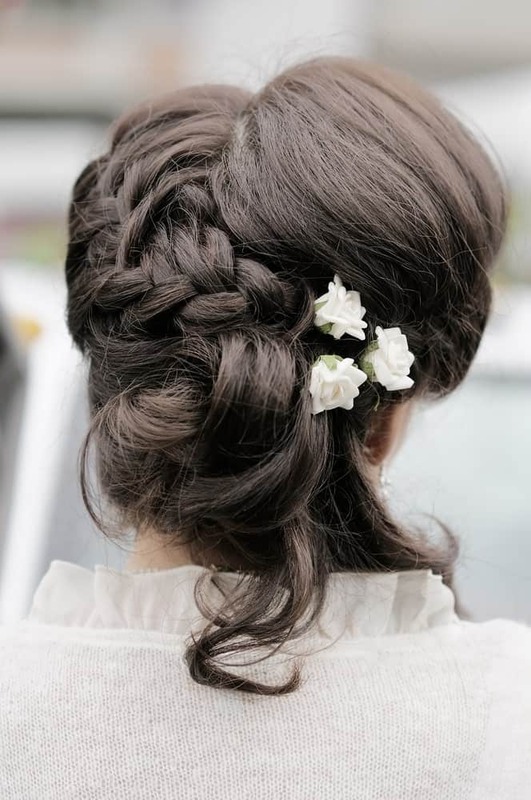 If you’re someone who doesn’t like a lot of fuss, this simple hairdo is perfect for you! 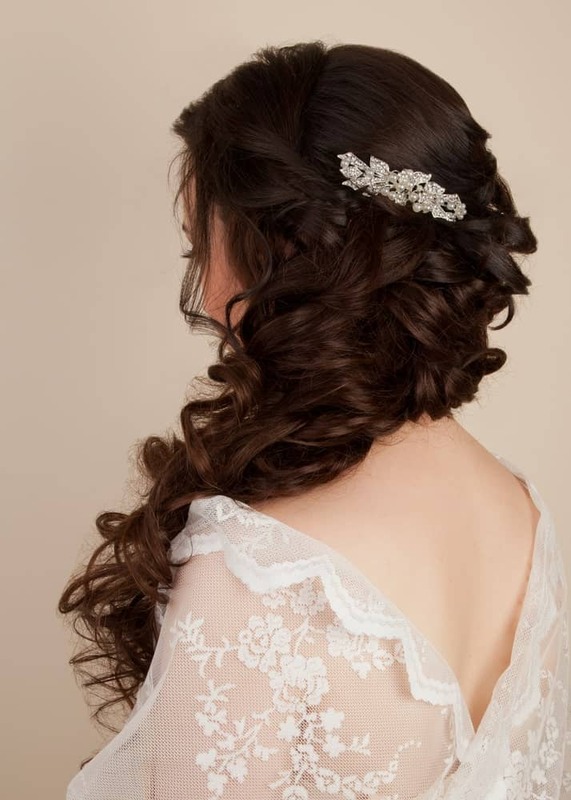 It features simple soft waves and loosely pinned back sides for a soft, girlish look. Continuing the trend of simple hairstyles, you could opt for a half up half down hairdo like this and keep things interesting by adding some tight curls to your hair for some texture. This hairstyle is a gorgeous option because it combines a little bit of everything. There are soft curly strands to frame the face, backcombing to add heights, pinned up twists for some interest, and gently cascading waves for a nice sleek finish. 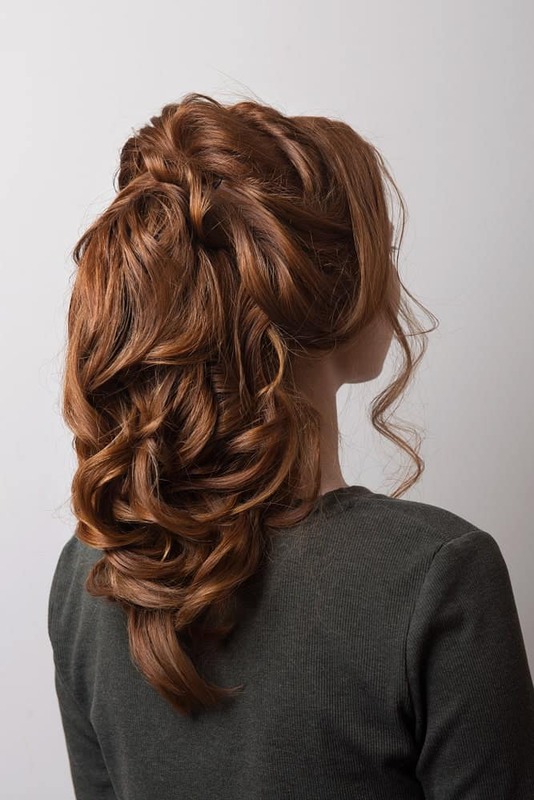 Another option for half up half down hairstyles is this sleek hairdo that keeps the backcombed bun simple but adds tons of volume with teased curls. If you want to add a little twist to the classic Hollywood curls, you can pin them back with a beautiful hairclip for a great touch. 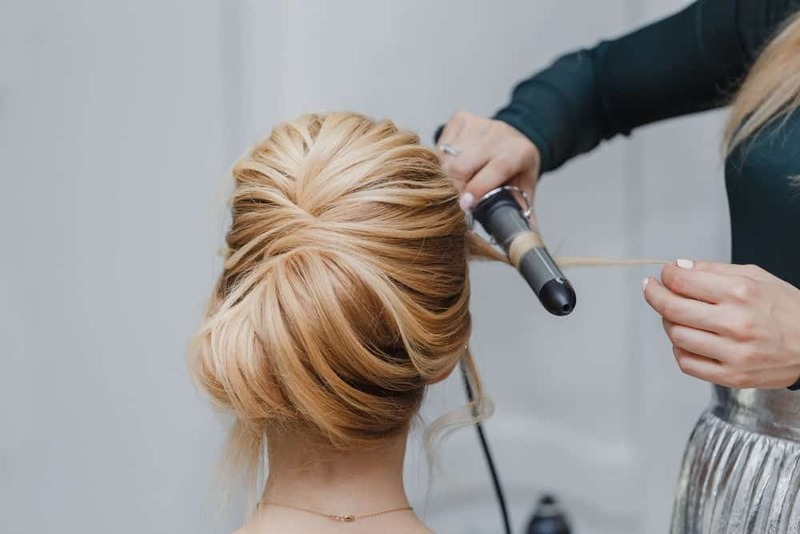 If you want to really stand out at prom, go for this hairdo with funky twisting top knots and cascading curls to accompany them. 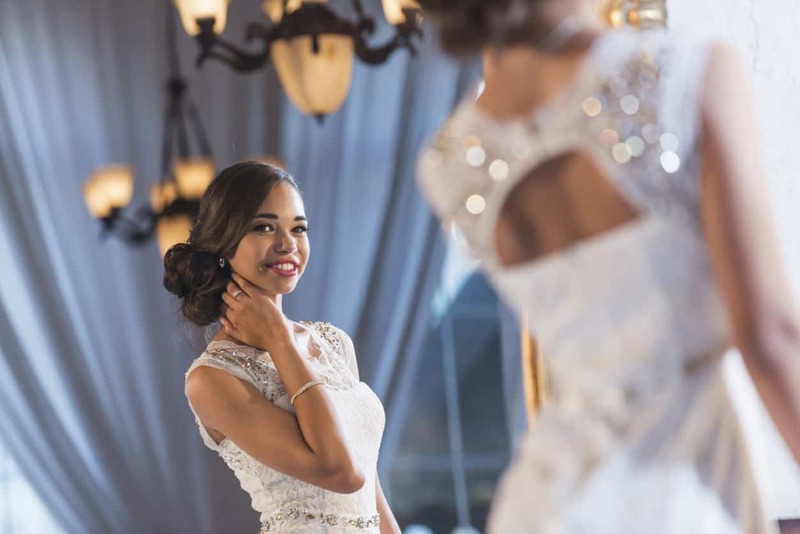 Simply pinning your bangs back and curling your hair can create a simple but beautiful look that is easy to maintain throughout the night and still looks lovely. 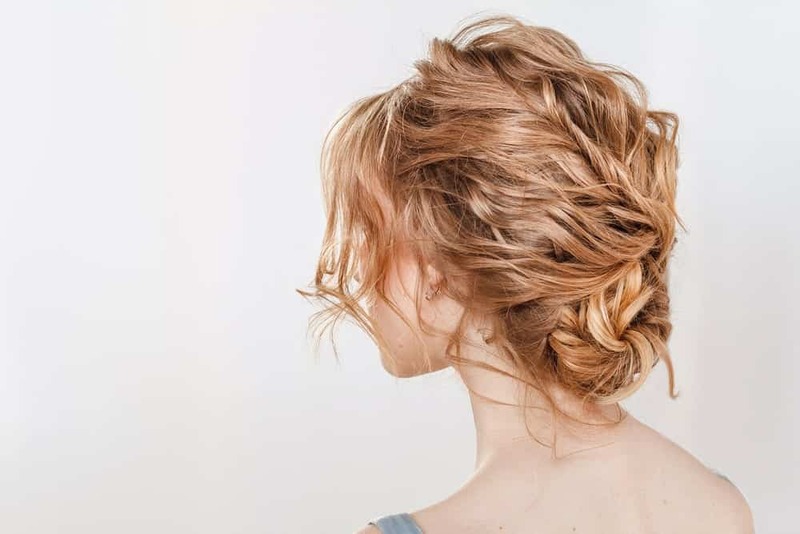 This hairstyle has a bun that incorporates some twists, braids, and some pinning. In other words, a bun that has all of our favorite things! There’s nothing quite as classic as a ballerina sleek hairdo. Though this may be for the more elegant amongst you, it still gives a very polished, mature look and we love it! This flirty hairstyle is a great option for medium length hair. It adds a good amount of volume and texture and looks extra pretty if you accessorize it well! If you have dreadlocks, a great way to style them for prom is to bundle them up in a nice thick bun. It’s going to make it look elegant and trendy while keeping your hair out of the way while you get down on the dance floor! 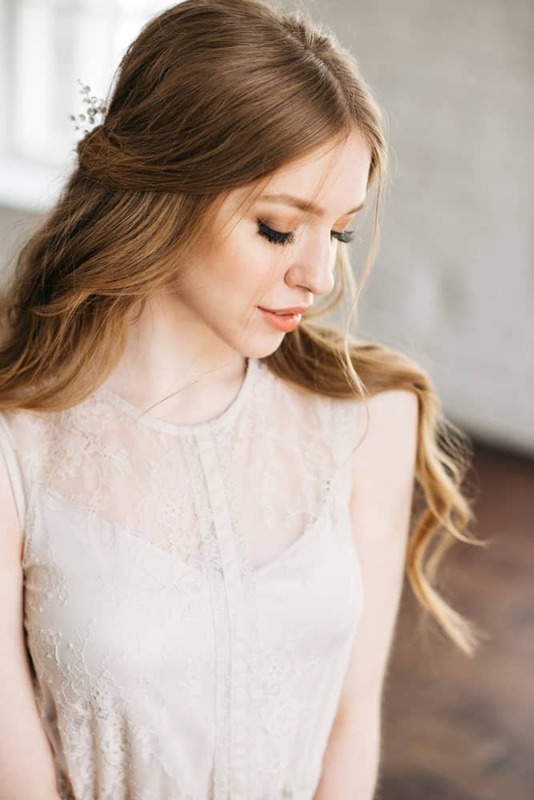 A gently cascading side waterfall braid is a great option for prom if you have medium to long length hair because there will be more hair to work with. 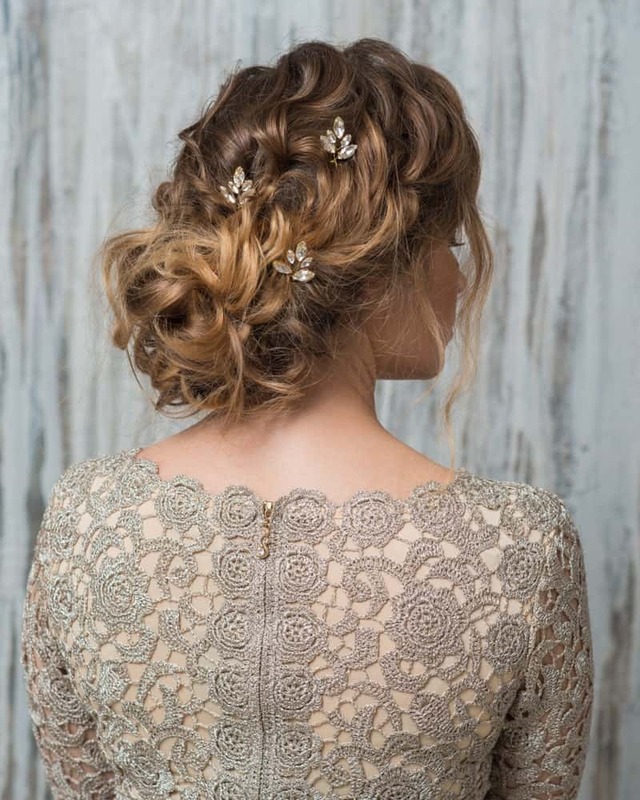 This beautiful hairstyle takes inspiration from bohemian hairdos with a few different combinations of braids that are twisted and pinned along the ponytail. The overall look is trendy and fun while still being pretty enough to turn heads. A side bun with flowers is never going to look bad. This particular hairstyle uses elegantly swept bangs with soft curling twists to complete the look.